Rune Factory 3: A Fantasy Harvest Moon takes the Harvest Moon series into the fantasy realm and features the same simulation/role playing experience that was made popular by the HM series. The game was released in November 2010 with development completed by Neverland Co. The game is actually the fourth in the game franchise despite its name suggesting it is the third. Gameplay is very similar to the previous games in the series and has mostly been polished while adding some minor gameplay improvements. 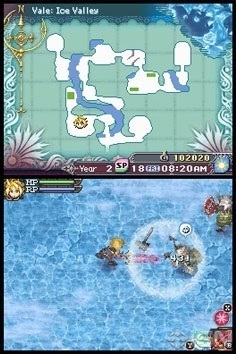 In Rune Factory 3 you will again take control of Micah who lands in a small town without his memory. You are then approached by Shara and take on the role of revitalising the town’s farm. While most of your time will be spent raising and selling crops for profit you can still experience plenty of other activities from fishing and gathering to more RPG focused experiences including dungeon crawling, monster fighting and even monster taming. New additions to the series include improve scheduling of game time, extra AI features, battle improvements and increased NPC interactions. 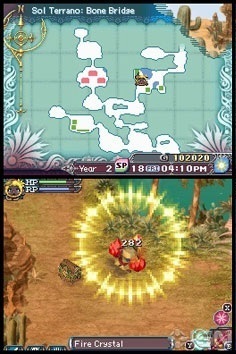 Rune Factory 3 has also added the ability for the player to transform into a golden Wooly (a sheep creature), to plant crops underground and the use of the town’s villagers to give you an edge in battle. If you don’t want to tackle the game alone you can even play with the new multiplayer options which allow 4 players to get together and explore some of the darkest dungeons for rare items. If you love Harvest Moon and want something with a little fantasy twist then you will love the Rune Factory series and the third instalment is definitely one of the best in the game franchise to be released yet. With the added multiplayer functionality you can even play with your friends which only enhances an already great experience. Harvest Moon meets fantasy genre. Plenty of new features compared with the previous games. Large number of activities to keep you busy. Multiplayer support for the game. Gameplay is simple but deep enough to attract gamers of all ages. Rune Factory 3 was the first in the series that I’d played. It’s also, in my opinion, the best! It just has a pretty good balance of all of the elements it offers on the box. I did have good luck my first go around and had the game completed pretty quickly. In game and real life, bc I played the game for three days straight as soon as I got it! I couldn’t put it down. Also you can bring your wife to go battle monsters??? What more do you want.